You’ve come so far. Don’t stop now. When you’re ready to bring your reality show to life, you need the right crew. Hilo Pictures inspires and informs your audience by creating powerful television programming. From reality TV pilots to full film trailers, we can do it all. If you need video production in Orange County, you need Hilo. Our cutting-edge equipment and unique cinematic production style help set your reality TV concept above the rest. Rely on us for the big pitch. Click to play 2 min trailer! Feast your eyes our recent HGTV reality pilot video production 2min trailer and behind the scenes photos with the cast and crew of "Hood & Home" filmed in L.A. and Orange County California. Thank you! Our production team will be in contact shortly. Behind the scenes at our latest Reality Pilot Video production in Los Angeles for "Hood & Home"
Our "Reality Pilot Dream Team"
Our passionate video production crew lavishly films tv commercials, series pilots, promos, trailers, EPKs, documentaries, branded and digital content for a wide range of broadcast media, digital cinema to smaller indie projects. Our world class video production team excels in every aspect of the production process. We take a brief from concept through shoot, edit, composite, design, mix and master to create compelling content for your idea, concept, business or brand and mix it in with compelling hollowed cinema style filming. Producing a strong tv pilot production, film trailer or market promo is essential to getting your audience and demographic excited about a product or TV show, and in the case of a market trailer or product promo, making authentic connections with your audience and repeat sales. Our video production team, directors, editors and producers are experienced in taking your brief and target audience into account when cutting film trailers and TV promos. Our broadcast and feature film capable video edit suites are complemented by an in-house animation and graphics production studio, allowing any visual FX and GFX titles to be created and seamlessly added onto the edit. Custom music tracks are available from our vast collection or we can create an custom audio score to match your branding and company style.In addition our experienced professional audio post production team can add subtle layers of sound design throughout making the video production much more engaging and unique to match your vision. Click to play full version! Anywhere at anytime available we will be there to get your pilot filmed! Reality pilots also require a creative start and a talented crew to make work on all ends of the spectrum. Our digital video production team excels in client communication and efficient concept development. Meaning, you can call us anytime during the day or evening and get a response on your needs. Heck, you can call the director at 2am if it means your pilot launches on time! You’ve done a lot of the work already, including concept development and we are here to make sure the creative juices flow in a proactive manner. After all, this is your vision that we’re bringing to life. You’ve already come a long way just in creating the idea for a series and being committed to seeing it come to life on web, television or motion picture platforms. Now it’s time to find the crew of allies who can help you do that. Hilo Pictures team of positive natured and creative producers, directors, cinematographers and post production experts will guide you in every step and ensure you keep the "grey hairs" at a minimum! Our latest reality tv pilot video production filmed in Los Angeles, CA and Orange County was a major success and our video production tv crew had a blast on this unique HGTV Pilot series. Our talented crew and actors were absolutely amazing. Rene (our reality tv talent) was far beyond perfect on every line and crushed it with her winning smile and tv personality. Filming the reality pilot series location 2 in this unique yoga studio in Los Angeles was fascinating in that the locations were especially down home and fit the neighborhoods for this pilot series perfectly. Location Vs. Talent Vs. Video production crew. Perfect 10! The Pilot series used a variety of cameras and reality pilot rigs set up for motion and on the go filming. Our unique sound and audio was a hit using studio sound and filming in every shot and scene. Run and gun filming for most pilots can be arduous in post production. However our director of photography takes the time after every scene to make sure we got the shot and the audio is on point perfectly to create a masterpiece series for tv or online media. My favorite scene at the table took multiple takes for this unique reality series pilot for HGTV. We spent time on this authentic dialog mainly because Rene (talent) is an actual Real Estate agent. 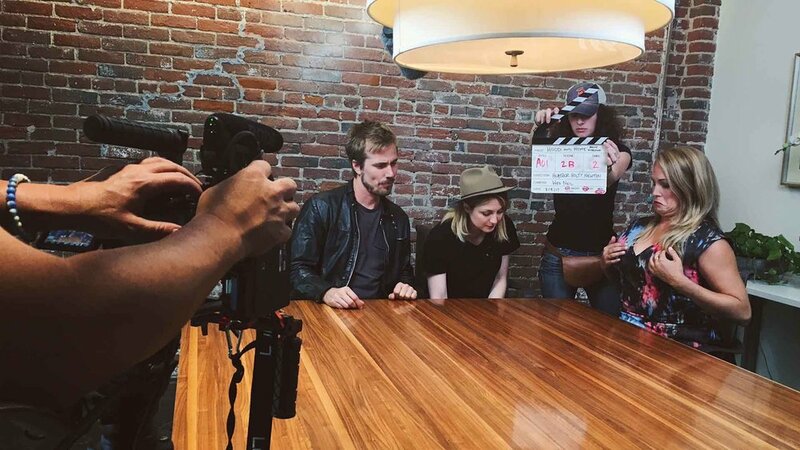 Authenticity is key when filming and creating this visual reality pilot experience.